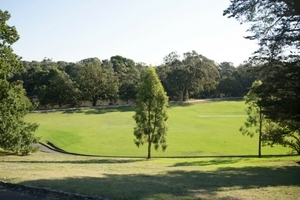 Fairview Park is within the large Fairview Park Reserve and beside the Yarra River. With tall gum trees, plentiful birdlife and large open spaces, it's a beautiful spot for picnics, walking or ball games. Fairview Park adjoins Wallen Road Reserve and covers 5.6ha with extensive open space for walking, ball games and picnics. A lovely oak-lined boulevard runs through the centre of the park, and dog-lovers and their four-legged friends will enjoy the generous off-lead area. Public toilets are located in the adjacent carpark for Wallen Reserve. In the 1880s, the reserve was called Tea Gardens and it was a popular destination by boat. The park's current design was created in the 1930s and the rockwork dates back to those days. Children will love the seesaw, swings and slides and enjoy playing among the trees alongside the playground. The park is available for hire for weddings, christenings and other events. To find out more or make a booking, see hire park, garden or reserve.